The last few days of February was pretty tough. I even thought about skipping March 2018 Bullet Journal Setup, but I’m glad I made myself sit down and spent some time to set up this month. It allowed me to escape the reality for a little while and cleared up my mind. I know this post is a little late, giving that it’s already the fourth day of March, I hope it can still be useful and inspirational for those who haven’t set up their March bullet journal. My March 2018 Bullet Journal theme was inspired by the song Sunflower by a Korean singer, Younha. The song is a self-talk of a girl who is nervously doubting if the path she’s chosen is right for her. Despite the lack of certainty, she tells herself to stay strong, happy and motivated. I can deeply relate to the lyrics. For my March 2018 cover page, I drew a big sunflower and calligraphed the word “March” in the middle. Sunflower is a beautiful symbol of power. I want to remind myself of always seeking out strength and positivity in a tough situation, like a sunflower who always reaches for the sun. Next to the cover page is a verticle monthly log that I frequently use in my bullet journal setup. I’ve tried the traditional calendar layout before, but I went back to this verticle layout because it’s more usable for me. My monthly goals are divided into weekly goals so that I can be more focus. I also have a section for random notes and things I need to do next month. Silly me! I keep making the same mistake every month of writing “next week” instead of “next month”. I fixed the mistake although I didn’t retake the photo. The March 2018 Bullet Journal’s habit tracker is my favorite page. I did something similar for the month of February and really enjoyed coloring in the boxes. 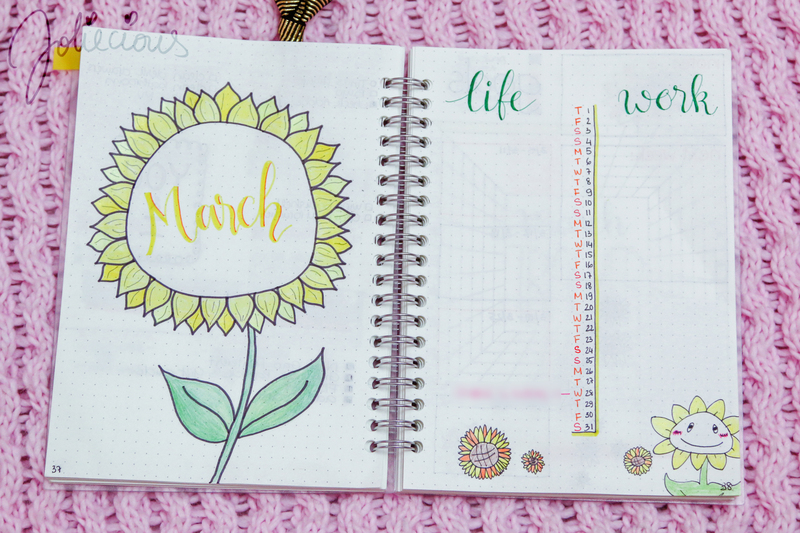 Of course, I had to doodle some sunflowers all over the pages to keep my theme consistent. As you can see, for this month setup, I incorporated a quote page that says “Life isn’t about waiting for the storm to pass. 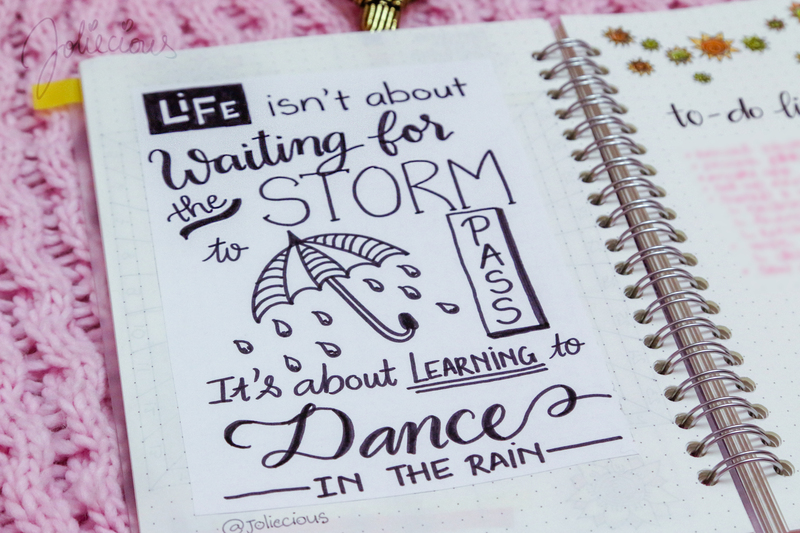 It’s about learning to dance in the rain.” This month’s theme has been about staying positive and motivated, thus this quote. I’m really happy with how this page turned out. On the right page, I set up the week of February 26 to March 4. I didn’t opt for the regular weekly layout because the week was pretty unusual for me. All I needed was a simple to-do list. Next week, I will go back to my normal day-by-day weekly layout. At the foot of the page, I wrote one sentence from the lyrics of the song, Sunflower. It’s in Korean, which means “I will cherish myself more”. I’m looking for more bullet journal page ideas to incorporate into mine. Do you have any suggestion?